As I finished this book I will now have read “How to Make Money in Stocks” three times, completing the 2nd, 3rd, and now 4th edition. I have read this book at different stages in my trading journey, and have used its principles successfully investing and trading. William O’Neil also runs O’Neil and Company and advises some of the world’s top money mangers, in addition he’s the publisher of IBD (Investor’s Business Daily), a wildly successful daily financial publication. 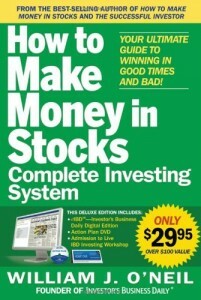 At the beginning of the book you will see the price charts of the greatest winning stocks over the past 100 years. They are marked with notes to help you identify what proper bases look like and what a stock looks like coming out of a cup with handle formation. You will see the difference between a strong chart and a weak chart. It is very interesting to see what a climax top looks like right when a stock runs out of buyers and then investors sell in a panic. It’s useful to understand how the 50 day moving average relates to a chart along with the general market. The book lays out excellent fundamental reasons for buying growth stocks using the CAN-SLIM method along with the rules on when to buy. It also advises to cut all losses to no more than a maximum of 7-8%, and to take profits when you find yourself up 20-25% in a winner. The key is to cut the loser when it starts failing to make new highs out of a chart cup with handle formation. Let your winners run and do not sell it unless it pulls back sharply or it runs to high to fast, failing to hold the new highs,forming a climax top. C – Current quarterly earnings up over the same quarter than previous year. A – Annual earnings growth rates of 25% to 50%. N – New products, services or management, along with new price highs. S – Supply and demand:big volume demand for the stock at key points. L – Buy only the leading stock in the top industry groups. I – Only buy stocks with some institutional sponsorship. M – Only buy into an up trending market. The book covers each of these areas in great detail. This deluxe edition of the book also has a free month of eIBD, an action plan DVD, and admission to a three hour IBD investing workshop. You will understand the CAN SLIM system after reading this book. This system was built after studying the greatest winning stocks of the past 100 years both their fundamentals and technicals. This book is a wealth of information and is not based on anyone’s ego, beliefs, or predictions. William O’Neil has turned making money in stocks into a science. AAII’s independent study showed the CAN SLIM method was #1 of many systems tested from 1998 to 2009 with an average 35.3% annual and cumulative 2,763% return. The one aspect of O’Neil’s methods is suggesting buying and holding stock mutual funds for 15-20 year time horizons, because unlike stocks they do come back and history has shown 10 year holding periods are almost always a win. Studies have shown you can double your returns in a stock index by simply selling when it crosses down through its 200 day moving average and only buying back when it crosses back above the 200 day moving average. I could not watch my mutual fund’s value melt away and do nothing as they do track the market very closely. I do not understand why O’Neil would put that in his book after the carnage of 2000 and 2008. I mentally can’t deal with large losses as I go to cash from mutual funds in recessions and down trends. 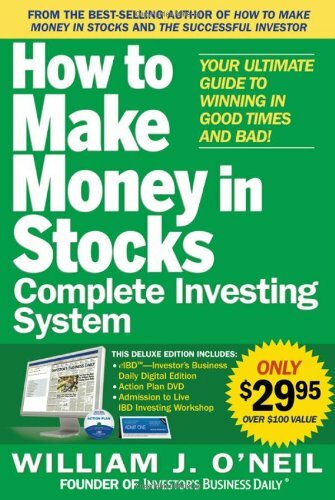 The book could have also gone a little deeper into the psychology of investing/trading, most traders and investors have huge problems cutting their losses, letting their winners run, and sometimes even pulling the trigger to buy the stock. I would love to have had a chapter on O’Neil’s thoughts on trading psychology. Maybe this will be a section in the 5th edition!